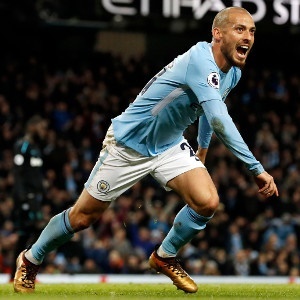 Manchester - Manchester City moved eight points clear at the top of the Premier League as David Silva's superb late strike capped a dramatic 2-1 victory over West Ham on Sunday. Pep Guardiola's side maintained their recent habit of finding dramatic, late winning goals, with Silva netting seven minutes from full-time at Eastlands to give City a record-equalling 13th successive Premier League victory. Silva produced his impressive volley after Nicolas Otamendi struck in the second half to cancel out a first ever league goal from Hammers defender Angelo Ogbonna just before the interval. City have drawn level with Chelsea in 2016-17 and Arsenal in 2001-02 for the most consecutive victories in a single season in Premier League history. The all-time record for successive victories is Arsenal's 14, achieved between February and August 2002. City also set a club record with a 20th straight win in all competitions, giving them the perfect preparation for next weekend's summit meeting with second-placed Manchester United at Old Trafford. West Ham are second bottom of the table after failing to win for the eighth consecutive league game. The visitors, looking for their first win under new manager David Moyes, looked surprisingly untroubled, in the first half at least, and arguably created the better chances of the opening 45 minutes. That was certainly underlined a minute before the interval when Ogbonna headed his side into an unexpected lead that exposed some poor play in City's defence. Aaron Cresswell exchanged a short corner with Manuel Lanzini and crossed for the Italian, who beat Otamendi to the ball and steered a well-aimed header into the corner. City were stunned but West Ham had enjoyed the better chances of the first half, while surrendering possession to the hosts. The best of three decent openings fell to Lanzini, in the 38th minute, after a rare mistake by Silva who gifted the ball to the West Ham man in midfield. The attack ended with City keeper Ederson turning his shot around the post, somewhat unconvincingly, as the visitors coped with City's impressive arsenal of attacking talent. City were curiously off the electrifying pace they have set so far this season. The only moment that really troubled West Ham reserve keeper Adrian - selected because City loanee Joe Hart was unable to play - came from Silva's deflected 25th-minute shot which he did well to tip over his bar. Guardiola had left Vincent Kompany and Fernandinho out of his starting line-up, to avoid either collecting a yellow card which would earn them a suspension and a ban for the upcoming Manchester derby. It had looked a potentially costly decision but, at the interval, the City manager brought on Gabriel Jesus and saw an immediate improvement. A foul by Declan Rice on Fabian Delph presented Kevin De Bruyne with a free-kick on the edge of the area and his superb curling strike was parried away, equally impressively, by the diving Adrian on 55 minutes. Two minutes later, City were level. Raheem Sterling's deft touch sent Jesus darting to the right-hand by-line from where his low cross was turned in from close range by central defender Otamendi. They could have been in front on 61 minutes when Leroy Sane's crisp shot drew another diving save out of the West Ham keeper. It was now one-way traffic with Sane's dribbling run and shot bringing yet another acrobatic parry out of Adrian before Sane and De Bruyne both tried shots from the edge of the area. Soon, Adrian was required to keep out a shot from Jesus with the rebound falling invitingly to Sterling who, uncharacteristically, miskicked from what looked a promising position. Silva struck in the 83rd minute with a brilliant finish, diving to meet De Bruyne's cross at full stretch and steer the ball in from five yards, past the wrong-footed goalkeeper.